The Rebel Sweetheart. : Chan Sung Jung, and throwback to UFC 163. Last Saturday, 'Korean Zombie' Chan Sung Jung battled it out on the octagon with Featherweight Champion Jose Aldo at the HSBC Arena in Rio de Janeiro, Brazil. And while the odds may not have been in favor of the Korean contender, the fact still remains that Chan Sung Jung is the first Asian to headline a UFC main event and fight for the championship title. A native of Pohang, South Korea, Chan Sung Jung made his professional debut in June 2007. He made his debut in the UFC four years later, in March 2011 at UFC Fight Night 24. 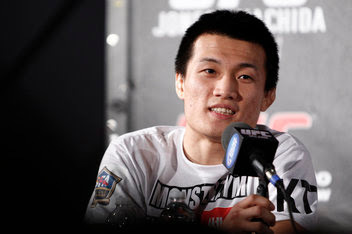 Chan Sung Jung's ability to fight aggressively and withstand heavy blows from his opponent has earned him several accolades in the UFC, including the 2012 Submission of the Year and 2012 Fight of the Year awards. 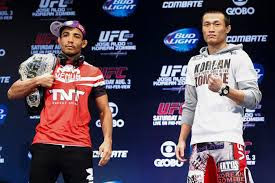 UFC 163 would be the biggest day in Chan Sung Jung's career as a mixed martial arts fighter, and in a pre-fight interview, the Korean Zombie said that he felt great physically and mentally, and will do his best to beat Jose Aldo. When asked as to how it felt to have reached the pinnacle of his MMA career, the 26-year-old Taekwondo black belter said, "It's been my goal and dream for several years now, so it means the world to me. I know that it would push MMA in Korea to the next level if I win, so a victory would be that much more important." Unfortunately, the Korean Zombie dislocated his shoulder during his match against Jose Aldo, which brought about a TKO loss in the fourth round. This would be his first loss in four UFC fights. "...when I separated my shoulder, I tried to put it back in myself, but it didn't work, and I think Jose noticed my shoulder was out, and he kicked me three times really hard. So unfortunately, the shoulder was not able to be put back in," said Chan Sung Jung during the post-fight press conference. Thankfully, the medical team was able to pop the shoulder back in and the Korean Zombie was able to speak before the press (together with his translator) - arm sling, bandages, and all. Would the Korean Zombie ask for a rematch? "As far as the rematch goes, I would love to get a rematch," he answered. "I would love to ask for a rematch, but I think there are other people that are waiting in line, and I probably have to get a couple more wins in the division before they'll give me another shot at the title." Sure, the Korean Zombie would have to work his way back up to the Featherweight ladder, and even he knows that for a fact. Here's hoping that he gets better soon - last I heard he also has an orbital fracture on top of the dislocated shoulder. His fans in and outside of Korea (including me!) will be looking forward to his return to the Octagon, and hopefully, for another shot at the title. Informative post! 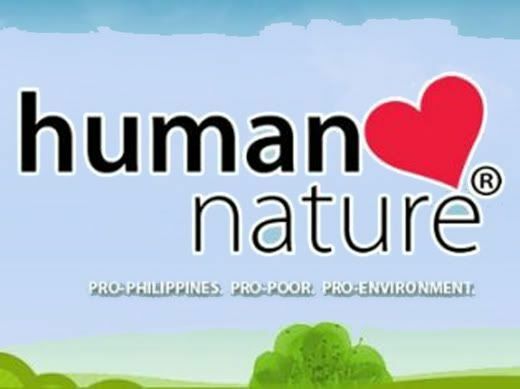 my friend will surely love this! I think it's great he wants a rematch and I do hope he recovers and is able to achieve this. Sounds like quite the fighter. He seems passionate about his sport! And realistic. Thanks for sharing! I'm not really into watching this kind of fight as I cannot bear seeing them hurting each other :( I hope his shoulder is okay now. It's nice to see more Asians in the UFC world. MMA is really exciting to watch. I haven't seen a UFC fight in ages! I know it's completely different but this guy might be the new "Asian" in the fighting world. Awesome!